We wanted a different getaway, a place warm enough to ignore the spring chill, with a drive of sufficient distance to remind us that we had escaped urban life for three days and two nights. Tree Tops near Citrusdal ticked the boxes. It wasn’t easy finding September weekend accommodation. 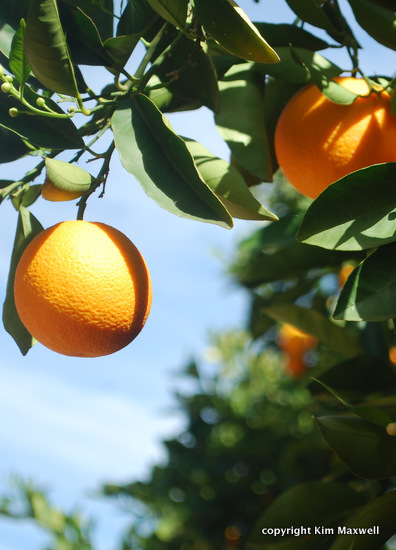 Only two hours from Cape Town, this is citrus country popular for mountain bike races and company retreats. Spring probably increased the demand, as the wild flowers were out in force. The Baths is an outdoor resort with hot springs that date to Victorian times. Their numerous affordable self-catering options were full – we were advised to book their weekend accommodation two months in advance. Luckily we heard about treehouses overlooking the river at a farm, 9km along a gravel road from The Baths, and grabbed the last one. The location was tranquil and beautiful. Tree Tops is a decent glamping option – somewhere in between self-catering and luxury camping. It’s privately owned and well equipped, but you won’t know in advance to what extent. The owners’ email provided a map, firewood at R20 a bag, and vague instructions to bring towels and food. In fact each treehouse has a double bed, basic linen, a bar fridge, kettle, plus glasses and mugs for two. A table and two chairs on the balcony, a small basin, and tiny electric fan were standard. One bigger treehouse had basic cooking facilities and a fireplace inside, so if you’re looking for solitude, it’s the one to request (we never saw the couple staying for one night). Communal toilets had separate shower rooms. They were clean and linked to the treehouses via wooden bridges. Showers were hot, but came without soap or two-ply. A stone kitchen on the lawns was equipped with a communal fridge, a couple of two-plate stoves, and cupboard for each treehouse – containing two sets of plates and cutlery, pots, wine glasses and a waiter’s friend. A drawback if all treehouses are occupied, you need to request extra bits and pieces for any extra children in advance. We’d called on arrival after finding only a bare mattress in our room as extra bedding for a five year old. 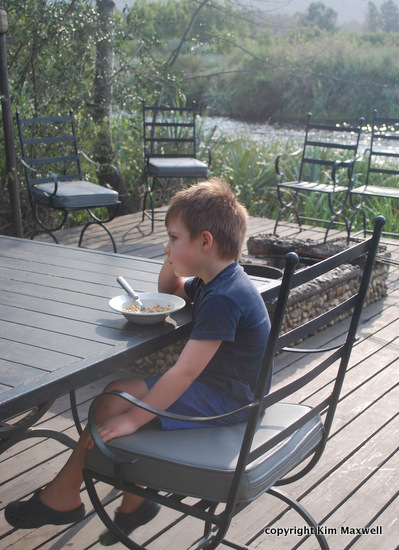 The communal braai area facing the river has a grid and a few seats, and makes a lovely sunset or breakfast spot. Two smaller braais are available if you don’t fancy being sociable. Which is a consideration. We had the place to ourselves on Friday. On the second night we shared a fire and a chat with a young apple farmer and his girlfriend, before taking our bottle of wine to our treehouse balcony once our son needed to go to sleep. If I returned I’d probably book out Tree Tops with two other families, and take over a few treehouses. Your kids need to be old enough to share a double bed with a sibling or friend in a separate treehouse. 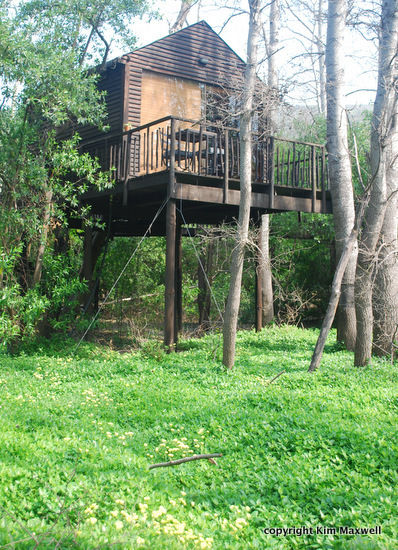 The treehouses are close enough for adjacent occupants to call to each other, but they’re suspended on stilts some distance from the kitchen and braai area – something to keep in mind, as some young urbanites struggle to sleep with noisy night crickets and chatty morning birds. That is also part of the appeal. It’s quiet, you’re in nature, views are lovely, and two-man canoes are tied to the riverbank for use. 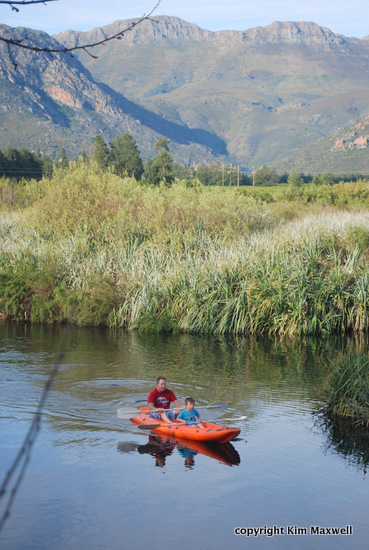 We had fun tackling the beer-coloured Olifants River with paddles. We also spent a day at The Baths as day visitors, alternating between bathtub temperatures in the hot springs and the icy swimming pool. TREE TOPS, Citrusdal. Adults R650 for two a night; children R120 per night.